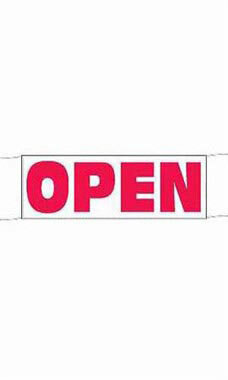 Let customers know your store is open and ready for business with this Economy Open Banner. The banner is 3’H x 8’W featuring bright red lettering on a white background that really stands out. The material is a rip-resistant polyethylene with double sewn hems. I was surprised at the quality of this banner; great deal for the price! I expected this to be torn up the first day I put it out. The wind was terrible (40 to 50 mph), but the ropes held. The sign not only looks good, but is durable.